Barbara and Bob Harwood’s generosity has been inspired by the blessings of a lifetime. Barbara and Bob Harwood have been generous supporters of many Hamilton charities over the years, so their response was immediate and positive when their financial advisor, Dan Wynnyk at CIBC Wood Gundy suggested they might wish to set up a permanent fund with Hamilton Community Foundation. “Thinking about the future, a fund at HCF made perfect sense,” says Barb. “We can focus on alleviating poverty and also give the Foundation flexibility to meet community needs as they change over time.” They plan to build the fund during their lifetimes and then add to their legacy through bequests. Both Barb and Bob grew up in families that valued giving back to the community. Bob recalls a seminal incident in World War II when half his B.C. high school classmates disappeared overnight as Canadians of Japanese origin were arbitrarily relocated. During and after the war, Barb’s father gave many needy families free coal until they got on their feet. Decades later, one relocated Japanese-Canadian family attended his funeral in Burlington and expressed gratitude for his generosity. Barb remembers her father saying‘no one will go without heat because they can’t pay.’ “That stays with you,” she says. The couple’s tradition of giving back is strong. Interested in outreach and interfaith dialogue, they are long-time volunteer leaders in the United Church. Barb spent her career in various nursing roles at McMaster while Bob’s terms as chair in the early days of Wesley Urban Ministries cemented his commitment to his adopted city. Barb is a fourth-generation Hamiltonian and both sides of her family have made distinguished contributions to the community. Retired from his career in marketing, Bob has published two books and numerous articles on social issues. He still writes a monthly column on world affairs. The Harwoods were attracted to Hamilton Community Foundation for various reasons. Barb cites the Foundation’s breadth of work and its impact on poverty. Bob highlights its commitment to working collaboratively and its strong fiscal management. But their incentive to give is the same. “We both feel very blessed and very fortunate, therefore we need to share,” says Barb. 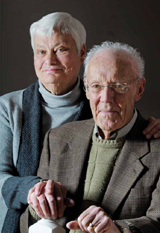 Through the Barbara and Bob Harwood Fund at Hamilton Community Foundation, that sharing will continue in perpetuity.